Windows Vista backup is a very useful way of gaining data security. Still popular, Windows Vista is the one of most widespread systems throughout the world. So Windows Vista backup software, both internal and third-party, is still highly demanded on the IT market. Handy Backup is a powerful utility capable to perform Windows Vista backup of any difficulty. This page describes features of both built-in tools for Windows Vista recovery from saved copies and of Handy Backup software designed for work on a most intimate compatibility with Windows Vista. Windows Vista contains the built-in backup service named Backup and Restore. It has two different functions related to safeguarding data. One of these functions is saving and recovering any files or directories specified by user, when the other possibility is a backup of an entire system image.Both methods are quite straightforward; specified data just is copied to the selected location or restored to the original place. Snapshot an entire system image (Business, Enterprise and Ultimate editions only). Such functionality can satisfy the need of casual backup or create an emergency-basis images of crucial files, but it is still far from usefulness when matters touches the organized, regular backup workflow supported by tons of automation for some business processes. So the need for third-party solutions is obvious in an area of Windows Vista backup software. 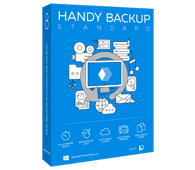 Handy Backup is a windows backup software for all modern versions of Windows, both in standalone segment including Windows 2000, Windows XP, Vista, 7 and the most modern Windows 8/8.1, and in server segment, including Windows Server editions of 2003, 2008, 2008R2 and Windows Server 2012. All its functions are completely available for any edition of Windows Vista. Some crucial features of Handy Backup related to Windows Vista backup are described below. The basic Standard edition for standalone computers can perform Windows Vista files backup. Try it freely for 30 days! Handy Backup has a capability to automatically select different types of data to perform the particular backup or restoration task. These data types include almost all types of modern databases, business data such as MS Exchange, Outlook, Excel or e-mails, user-defined files and folders selected by smart file masks, Windows libraries, websites content and the images of entire disks (including system drives). All tasks performed by the software under Windows Vista backup strategy can be scheduled by a regular basis with a period from minutes to months. Performing tasks can notify users on results of activity using E-mail notifications and logging. It is also the possibility to run some programs before or after running of any particular task. The "Works with Windows Vista" logo shows that Handy Backup has been tested for baseline compatibility with PCs running the Windows Vista operating system. The core functionality of our backup program is proven to work with Windows Vista and deliver high-quality experience under any system configuration. Handy Backup is free of malware, has all necessary Authenticode certificates and follows all policies required for the best performance. The “Certified for Windows Vista” logo ensures that each component of Handy Backup is fully compatible with Windows Vista and is verified to work perfectly with all of its premium features. The program satisfies the whole range of requirements regarding availability, reliability, security and supportability, and delivers a high standard backup solution for both home users and business enterprises. All these features makes Handy Backup the perfect Windows Vista backup software, designed and dedicated to protect user data from any perils at very long time. Try it and see all the might of Handy Backup using under your copy of Windows Vista! Database Backup - back up any ODBC compatible databases including MySQL, Oracle, FoxPro, Interbase, MSSQL, DB2, MS Access, Postgre SQL etc.